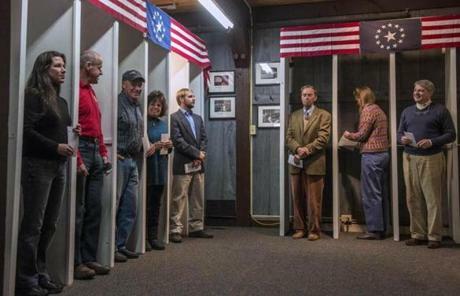 Voters prepared to cast their ballots inside polling booths just after midnight in Dixville Notch, N.H. 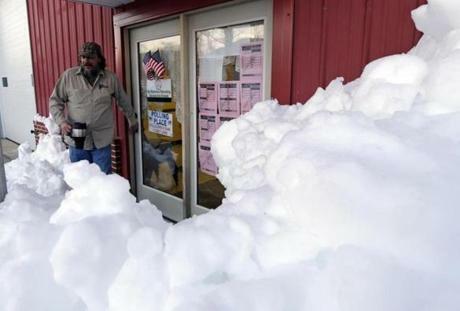 Voters in Dixville Notch traditionally cast the first ballots on Election Day. 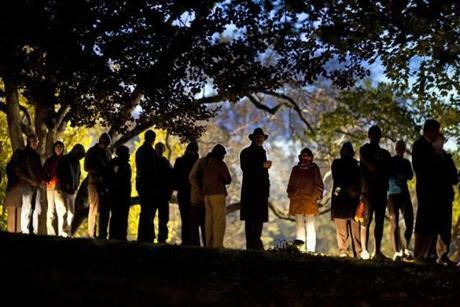 Students at Old Dominion University waited in line to vote at Larchmont Elementary School in Norfolk, Va.
Virginia residents waited in line in the pre-dawn hours to vote at Nottoway Park in Vienna, Va. 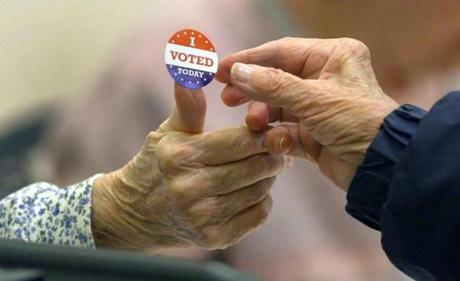 Poll worker Rosemary Good handed out stickers in Belmont. 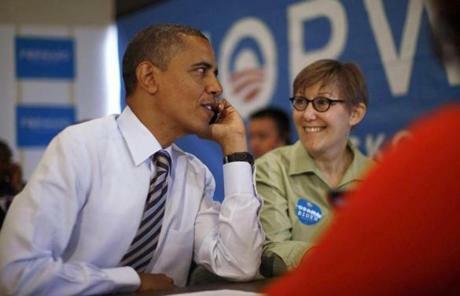 President Obama sat next to a volunteer as he called other volunteers during a visit to a campaign field office in Chicago. 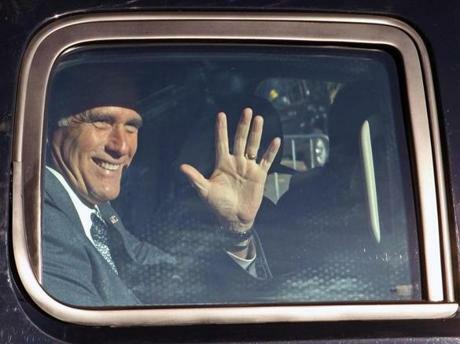 Mitt Romney waved to a crowd of supporters after voting in Belmont. 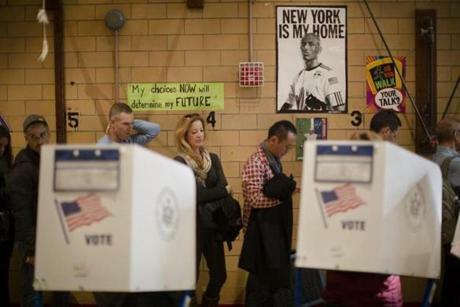 Replacement voting sites were created in Queens after Sandy damaged the existing polling places. 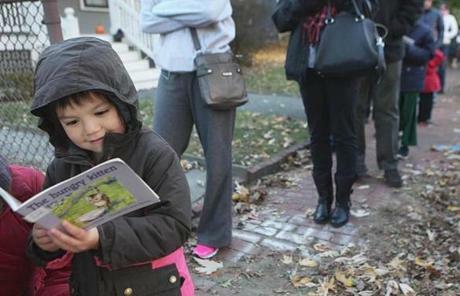 Alice Vu, 5, read “The Hungry Kitten,” while waiting outside a polling station on Lexington Avenue in Cambridge. 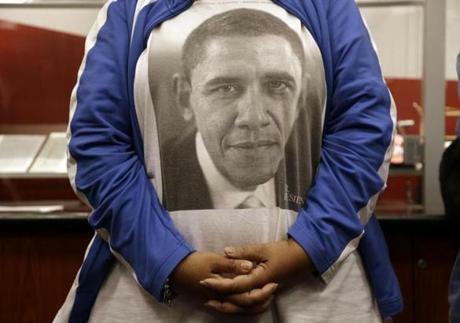 United Auto Workers retiree Jackie Smith listened during a rally on Election Day at the UAW Region 1 technical training center in Warren, Mich. 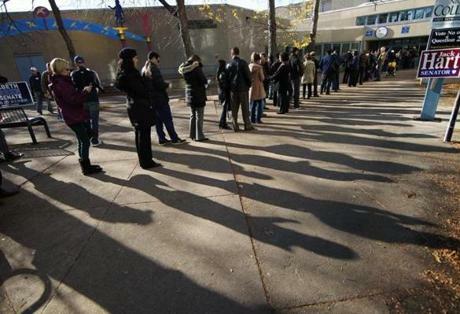 Voters waited in long lines at the Condon School in South Boston. 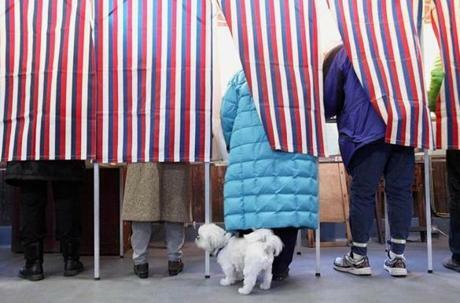 Lines were prevalent at many polling places in Massachusetts. 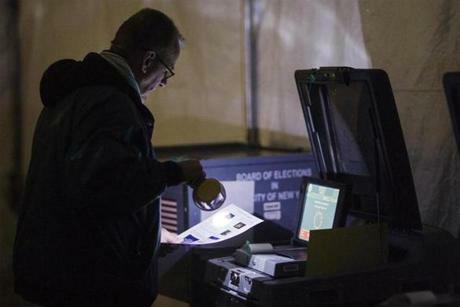 A three-picture photo combo showed Nina Bush casting her ballot on an electronic voting machine in Toledo, Ohio. 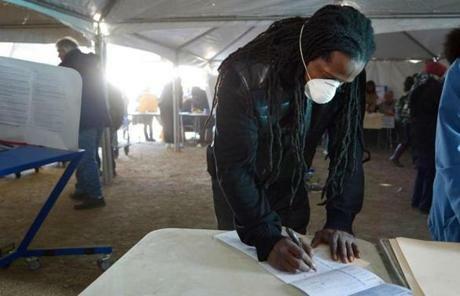 Voter Jesse James of the Rockaways, N.Y., filled out a voter form at a polling site located in a tent due to the area's continued recovery from Hurricane Sandy. 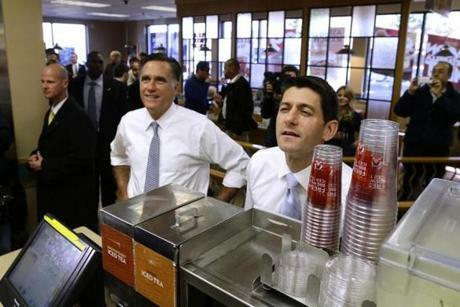 Republican candidate Mitt Romney and running mate Paul Ryan made an unscheduled stop at a Wendy's restaurant in Richmond Heights, Ohio. 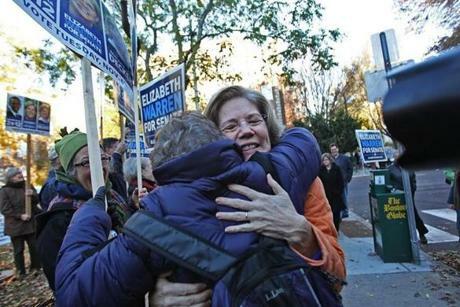 A boy peeked out of the voting booth in New Hampton, N.H.
Elizabeth Warren greeted supporters at the Graham and Parks School in Cambridge. 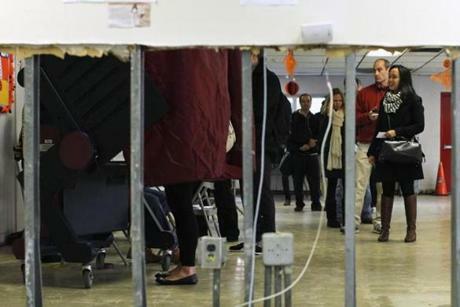 Senator Scott Brown encouraged pupils at the Sullivan Middle School in Lowell to encourage their parents to vote for him. 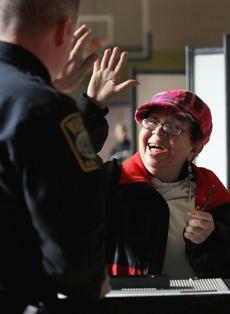 People walked past a polling station in Washington, D.C.
Milagros Pena high-fived Boston Police Officer Brendan Lyons after casting her ballot at Orchard Gardens in Dorchester. 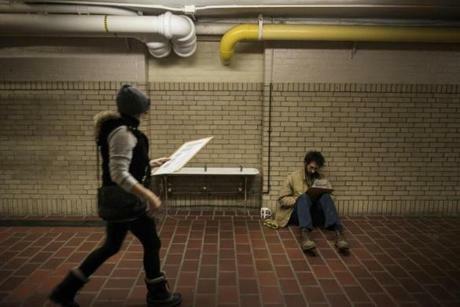 Voters waited to cast a ballot in the Chelsea neighborhood of Manhattan. 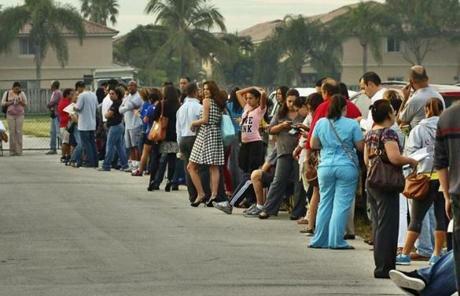 Voters waited in line to cast their ballots in Miami. 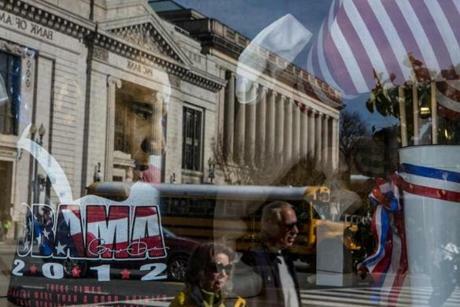 A street scene was reflected in the window of a gift shop near the White House in Washington, D.C. 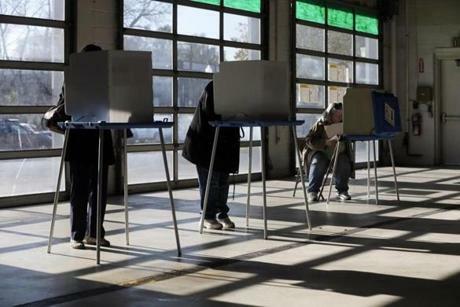 Voters filled out their ballots in a vehicle storage bay at Armory Garage, an auto dealership in Albany, N.Y. 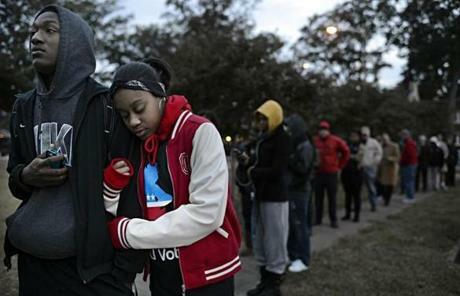 Voters at Tremont Elementary School in Cleveland, Ohio. 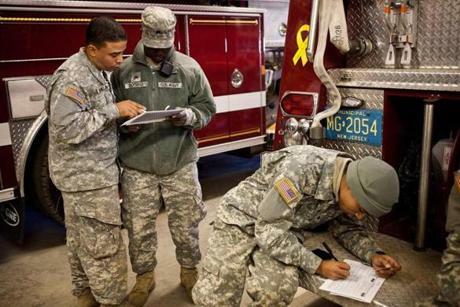 Members of the Army National Guard filled out absentee voter ballots for the presidential election while temporarily stationed along the New Jersey coastline to help with the recovery from Sandy. 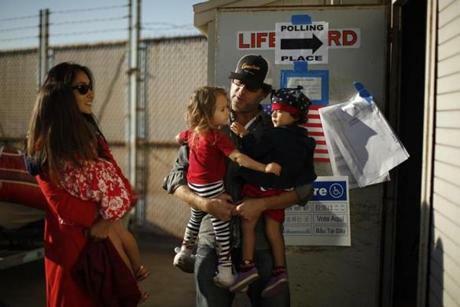 George Klein, Jenine Kanell, and their children lined up to vote at a Venice Beach lifeguard station in Los Angeles. 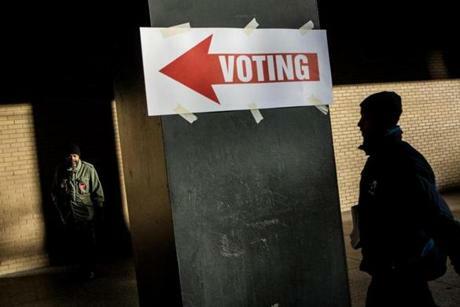 People lined up to vote at a polling station set up for those affected by Sandy in Hoboken, N.J.
Voting was brisk as the polls opened at a fire station on Lexington Avenue in Cambridge.